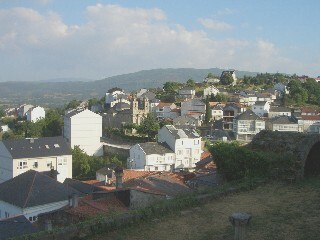 This is a stunning mountain top town with a castle and a couple of churches and it is hidden away deep in Ourense province. Despite its isolation, it is 45 minutes from Ourense city and a good three and a half hours from Santiago de Compostela, it is definitely a top tourist spot for those who have the time to make the journey. 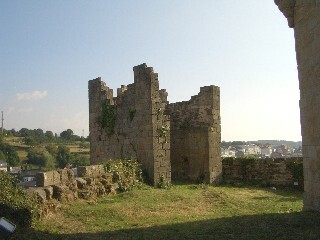 Getting to Castro Caldelas is something you need to pay significant attention to. There is a simple and straightforward course from Ourense on the OU-536, but if you have been to Monforte de Lemos (on route) you may be tempted to take the more scenic cross country road from there. DO NOT. This road takes you on the most terrifying car journey you are ever likely to encounter. You progressively climb up a mountain without any awareness of your elevation before facing a dissent on a narrow carriageway barely wide enough for two vehicles to pass. The drop to your right is vertical and of several hundred feet and the presence of barriers is intermittent and always absent on the external bends. The barriers are often broken (indicating the vehicles that have left the road in the past) and we had to stop several times to check our underwear - and I am not joking. If you have an interest in taking the popular Ribeira Sacra river boat trip beware, this boat ride starts at the very point that this road finally reaches the valley base. Travel to it via Ourense, not Monforte. 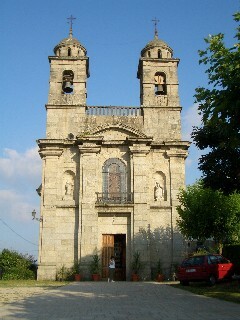 When (and if) you reach Castro Caldelas you will enter it at the main square seeing a number of café bars, some road side parking and an elegant stone church. Signs will direct you to both the castle (which is visible anyway) and the tourist office which is opposite the castle's main gate. The tourist office is purpose built and has some good interactive features. It is manned by none English speaking staff and unfortunately has a very limited supply of free leaflets, all in Spanish. The tourist office also has a galeria balcony that you can walk on and from which you can enjoy views over the mountains and into the valley below. 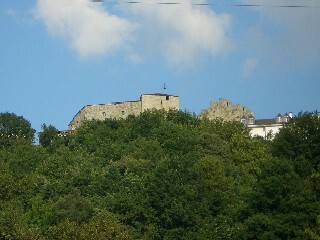 Left, the castle ruin sits at the highest point of the town and has excellent (and free) access. There is a lso an interactive visitor center.